It’s hard to forget the years that we’ve been plagued with Japanese beetles. These ravenous creatures can destroy your lawn, garden and good nature in one season by eating away precious time and money invested in our landscapes. As they know no boundaries, Japanese beetle control methods are most effective if neighborhoods band together in their efforts. So, rally the troops! 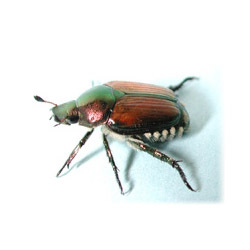 Japanese beetles are a problem at two stages of their life cycle: larvae and adult. 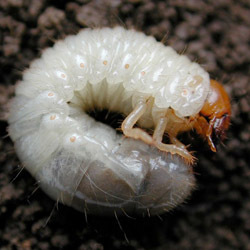 The larvae, called grubs, are actively feeding from August through October and again in April through May. It is during this time that the grubs are closest to the soil surface feasting on plant roots, especially grass roots. A heavy grub population will result in dead patches of turf that can be lifted like a carpet. Japanese beetle grubs are 1 ½” long, C-shaped and white with a brown head. When gardening, you will almost always find some grubs in the soil. Small populations of grubs can be present in the soil without significant damage to the lawn. If you notice more than a dozen per square foot, however, this constitutes a problem that should be dealt with. Adult Japanese beetles have a hard-shell body that is about ½ inch long. They are metallic-green and copper-colored. At this stage, beetles can decimate a plant in record time by skeletonizing the leaves – nibbling off all the foliage between the veins. Adult beetles start to emerge from the soil with a frenzy of feeding, mating and laying eggs. You will find adults feeding in groups in full sun, and they feed on over 300 different species of plants. These insects maintain this frantic level of activity through the first half of August. The females lay their eggs on the ground. When the eggs hatch they dig their way into the soil to feast on plant roots in preparation for winter. As soil temperatures decrease the larvae move deeper into the soil only to resurface and feed on plant roots again in spring. There are several methods to control both Japanese beetle grubs and adults, some environmentally-friendly and some more harshly chemical. Always read pest control labels in their entirety even if they are listed as organic or environmentally-friendly. These labels are meant for the protection of you, your plants and the planet. Manual Removal – Pick off and destroy the feeding adults even if you see just a few. Japanese Beetles produce pheromones that will attract many more to your property, so it is best to pick them off and destroy them right away. Use Non-Attractive Plants – If you have a shade garden you will not have a problem with Japanese Beetles. In sunny areas, choose plants that beetles don’t like. Trap – Pheromone traps lure adult beetles, sometimes hundreds a day, and trap them in a disposable bag. Replace the bag as necessary. Place trap at least 20 feet from the plantings that you are trying to protect to lure the beetles away. Row Covers – Floating row covers of reemay fabric may be placed over plants to avoid beetle damage by keeping the beetles from accessing the plants. Pyrethrins – These insecticides are naturally derived from the pyrethrum daisies. Pyrethrins attack the insect’s central nervous system, producing a rapid knockdown. The residual effect, however, is only 5 days, so several applications may be needed to control severe infestations. Insecticidal Soap – This soap is a contact kill with no residual control, but can be useful for smaller infestations or few beetles. Neem Oil – This oil is an organic control that repels Japanese beetles. Spray early in morning or on an overcast day. Because neem is an oil, you may burn plant leaves if spraying in full sun. Sevin – This chemical is absorbed through the skin and will kill beetles on contact. It has a 7-10 day residual effect but must be reapplied after a rain. Consult label for recommended time that fruit and vegetables may be consumed after application. Pyrethroides – Synthetic pyrethrin-like insecticides kill on contact and have an 8-10 day residual effect. Fruits and vegetables may be consumed in a shorter time period after application than Sevin. Acephate – This systemic control works by poisoning the plant. The insect dies when the plant is ingested. Must not be used on edibles. Malathion – This chemical must be ingested by the insect, however, this product may be used on edibles. Check label for number of days between last application and safe harvest. Imidacloprid – Sold as a liquid form of Merit, this product is systemic and must be applied at least 20 days before anticipated adult Japanese beetle feeding. Only one application is needed per year. Use only on ornamentals. Milky Spore – This biological control effects only Japanese Beetle grubs. Once this bacteria is established it can last in the soil for up to 20 years. It is completely harmless to people, pets, birds, fish and beneficial insects. Apply anytime the ground is not frozen. Beneficial Nematodes – These microscopic worms kills grubs by feeding on, and reproducing in, the grub’s body. This is an excellent choice for a vegetable garden and should be applied after the soil is warm. Late summer/early fall application is best. Merit – The granular form of this chemical is a systemic, season-long grub control with a 4-month residual effect, though it must be ingested by the insect. It is applied 3-4 weeks before grubs are actively feeding, mid-May through mid-June. Must be watered-in within 24 hours of application. Dylox – This compound is absorbed through the grub’s ‘skin’ and will kill within 24 hours of application. Use only in late summer through early fall while grubs are still close to the soil surface. Must be watered in. It is active for up to 7 days in the soil. Sevin – In its granular form, Sevin is a contact kill and will not remain active in the soil longer than 7 days. This product is used most effectively from mid-August through mid-October. Must be watered in. With so many options for effectively controlling these pernicious insects, there is no reason why you need to keep being bothered by Japanese beetles. Once you know more about these insects and their habits, you can easily keep them away.